Written by Catherine Saxelby on Friday, 09 May 2014. The best-selling CSIRO Total Wellbeing Diet has come under scrutiny over the validity of its research and the concern that a diet high in meat can lead to bowel cancer, which is one of the more common cancers at present in Australia. 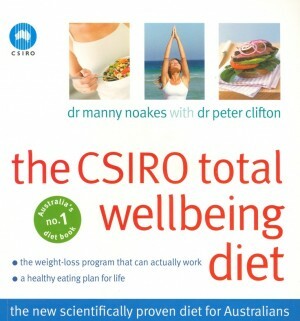 CSIRO has also been criticised for lending its name to a diet book as they are the country's national research agency. Developed and tested by Australia's CSIRO, this diet produces a slow, steady weight loss thanks to high protein, balanced meals. An occasional glass of wine is also figured in. CSIRO scientists say it works to improve overall health as well – their studies show that overweight women with high triglycerides (a marker for people at risk of heart disease) can lose 25 per cent more weight on this high protein, low fat diet than on a high carbohydrate, low fat diet. Much of this extra weight loss is in the abdominal area, which is crucial to improving their metabolic health. The high protein diet also can lower glucose and insulin levels, and help to control hunger. Kidney function and bone turnover markers are not affected, a major criticism of high-protein Atkins-style diets. The diet works by swapping some carbs for protein so you eat larger portions of meat, fish, chicken, eggs and cold meats and less potato, rice, pasta and bread. Best of all, dieters seem to be able to stick to a higher protein diet. The CSIRO reported that fewer volunteers dropped out of the high protein program compared to the drop-out rate for the volunteers on the high carbohydrate diet during the study. Regular exercise is stressed, from walking or swimming to using a pedometer to reach a goal of 10,000 steps a day. Guidelines for phasing into a Maintenance Plan and what to add to your base diet are also provided. Let's look at the 4 main criticisms. On Level 1 of the diet, you'll consume 5550kJ (1200 calories) which is the lowest level and will suit most women. There are a further three levels for more active women and for men set at 6000, 7000 and 8000kJ. This level of intake is appropriate for weight loss for both women and men. Diet by simply swapping some carbs for protein so you eat bigger portions of meat, fish, chicken, eggs and cold meats and less potato, rice, pasta and bread. It allows you 6-7 serves of healthy carbohydrates a day - you're told to eat 2 slices wholegrain bread, 1 bowl of high-fibre cereal or oats, 2 pieces of fruit and 2 dairy foods. This gives you a total of around 200g of carbs a day (which equals 40% of the kilojoules from carbs which is at the lower end of recommendations but still ok). In contrast, the traditional low-fat, high-carb diets of the 1990s made you eat 250 or 300 g of carb a day (5-70% of the kilojoules) and often didn't differentiate between refined, processed carbs like white bread and white rice and these healthier versions. Like most sensible diets, it limits fat, especially the bad saturated fats, but you're allowed 3 'units' (teaspoons) of oil, soft margarine, avocado or 20g nuts. In terms of vitamins, minerals, fibre and antioxidants, it does meet all the recommended intakes and gives you a balanced diet – in fact, it addresses the two main deficiencies in the average diet, namely lack of iron and zinc, common in women. The big plus is the quantity of non-starchy vegetables you eat – salad with lunch and one cup of veges with your dinner meal. 2. How much meat do I have to eat? plus 100g serve of any protein food such as salmon, ham, eggs or chicken for lunch. These are large serves, larger than what's currently suggested but not excessive in terms of what many males eat nor what is served in pubs and steakhouses. I regularly note steaks on the menu boasting they are 300g, 400g or even 500g (1lb) in weight. The protein accounts for much of the success of the diet as meat adds satiety and helps control hunger. The researchers were initially worried about the effect of this much protein on kidney function and bone turnover markers, a major criticism of high Atkins-style diets. But their research found that they were not affected. stick to lean fresh meat from your butcher (no processed meats such as corned beef, ham, bacon or sausage). According to a 2005 large European study, the strongest link with meat and cancer turned out to be with processed deli meats. Read up on our overview of the risks from burned and charred meats and barbecuing in general. Remember that the large serves of vegetables and fibre you are meant to eat will counteract the risk – meat was only significantly associated with cancer risk in those with a low intake of fibre (less than 17g a day) which is not the case with the CSIRO diet which offers lots of fibre. The only caution is the 200g quantity. In this study, eating more than 160g of red meat each day (fresh AND processed) increased the risk by 35 per cent compared to small meat eaters. But it wasn't clear whether this applied to fresh meat alone. If you come from a family with a history of cancer, the safest advice is perhaps to decrease the meat serves from 200g to 150g – remember these are raw weights. Meat 'shrinks' during cooking, losing a little moisture and fat. I contacted Dr Mannie Noakes to ask her directly about the diet promoting red meat because of the funding from Meat and Livestock Australia (MLA). It turns out that over the course of 5 studies examining a high-protein diet, the CSIRO was funded by three different industry organisations (MLA, Dairy Australia and Goodman Fielder, who manufacture breads and cereals). Only one of the 5 studies was ultimately funded by MLA and there was also funding from CSIRO's central pool and the NH&MRC, Australia's peak medical agency which distributes government research grants. What's more, CSIRO approached MLA for assistance with funding, not the other way around. Obtaining research funding from both government and commercial sources is common these days, due to a lack of research money from the government. This diet swaps some carbs for protein but is not an Atkins no-carb approach. If you enjoy eating lean meat, fish and eggs (or if you eat out a lot), but want a diet that's nutritionally sound, this is the diet for you. Overall the CSIRO diet takes a sound approach to weight loss with convincing research to back up its promises. If you have diabetes you may be interested in my review of the CSIRO & Baker IDI DIABETES Diet and Lifestyle Plan. The CSIRO Total Wellbeing Diet (by Dr Manny Noakes with Dr Peter Clifton, Penguin, $34.95) Books 1 and 2 plus The CSIRO Diet Cookbook. Reference: Meat, fish and colorectal cancer: The European Prospective Investigation into cancer and nutrition. J Nat Cancer Instit 2005:97:906-16. Q. How can I manage on a salt-free diet?